Hi I'm David, and here you'll find out a bit about me, my experience and how I came to be a DJ ! I first had the taste of DJing when I was just 15 years old. A school friend of mine had his own Disco setup, and I went out with him on a few bookings. The set-up in them days was a twin record turntable console, lots of large light screens, and massive boxes of 7-inch singles. You needed very strong arms to lift everything! A few years later, at University I got involved with Student Radio. Initially I presented an hour-long 80s Radio Show on Saturday mornings, sandwiched between the Breakfast show and sports programme. It was broadcast on its own FM transmitter (before Internet streaming came along). I enjoyed it so much the first time, that I then presented a two-hour 80s daytime programme, plus a late-night 1am show. Again this was broadcast to the local area on FM radio. Roll on several years later, about 3-and-a-half years ago, I was involved with a local Primary School PTA and got the opportunity to DJ once again. I started off on some basic borrowed equipment and got the 'bug' again! 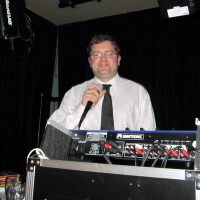 I DJ'd for friend's parties, and gradually invested in my own equipment (and subsequently replaced most of it since!). I now have a professional-looking, fully self-contained set-up that I believe is neat, tidy and pleasing to the eye. 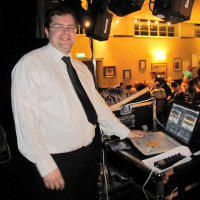 I have been fortunate to play in many different venues - from some of the largest including Blackpool Pleasure Beach's largest function suite "The Paradise Room" and The Albert Halls in Bolton - to some of the smaller more intimate venues including Smithills Coaching House (Smithills Hall Country Park) and Westhoughton Cricket Club. I can now cater for most types of function, including Weddings, Birthdays, Anniversaries, Engagements and other celebrational parties. I am still involved with the local School that got me started again, and provide DJ and PA services to them for their parties and PTA events. Thank you for reading my "about me" page. I hope that you enjoyed it. Why not browse the Photo gallery, or make a booking enquiry.